USDCHF is massively affected by some economic data in Switzerland such as Switzerland’s UBS consumption indicator, the ZEW economic expectations and Switzerland’s Q1 industrial production data. USD/CHF is rallying up the ascendant channel but it is not showing any momentum for further rise. 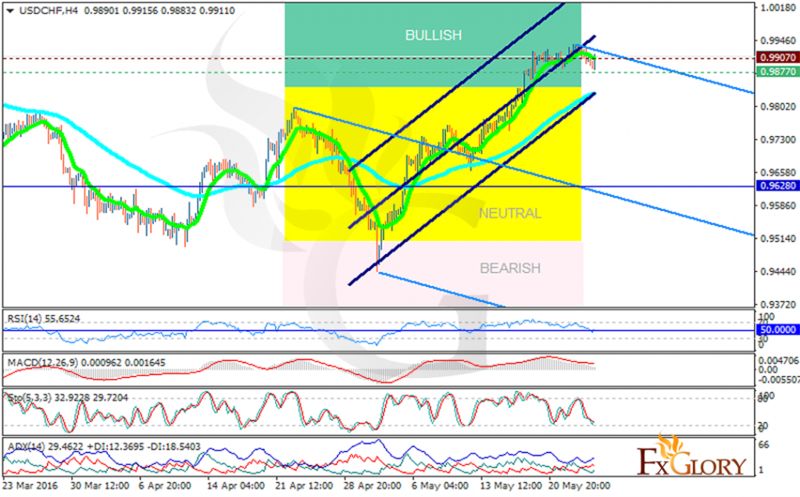 The support rests at 0.98770 with resistance at 0.99070 which both lines are above the monthly pivot point at 0.9628. The EMA of 10 is above the EMA of 75. All indicators are showing price decline. The MACD indicator is in neutral territory, the RSI is close to the 50 level, the Stochastic is confirming the bearish trend and the ADX is showing stronger sellers. Short positions are recommended with the target at 0.9980.